LivingSocial.com is having a Marvelous May Savings Sale. 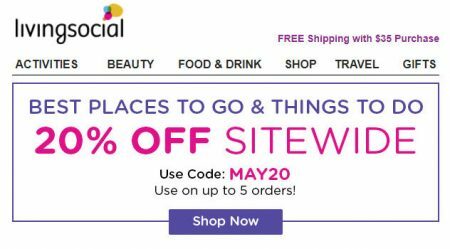 Save an extra 20% off sitewide (all deals) when you enter the promo code MAY20 at checkout. I’ve tested the code and can verify that it works. You may redeem on up to 5 (separate) transactions. Savings will apply to 1 item in your cart at a time. The promo code is available for 2-days only from Thursday, May 3rd to Friday, May 4, 2018. It’s good for purchases of any amount with a maximum savings of $50. This is a hot deal because most of the deals on LivingSocial is already discounted 50-95% off! You’ll find lots of great deals with the extra 20% off (sale on sale)! Click here to visit LivingSocial.com and view all of their latest deals.